Greg here. If you’ve followed my periodic contributions to Seakettle, you may have noticed that when it comes to creative projects, I’m a two-trick pony: cheesecakes and log slices. True to form, when Jennifer went out of town last month, I decided to make her a cheesecake to welcome her back. I figure that if I shower her with gifts and/or treats when she comes home, she’ll be more likely to hurry home the next time. 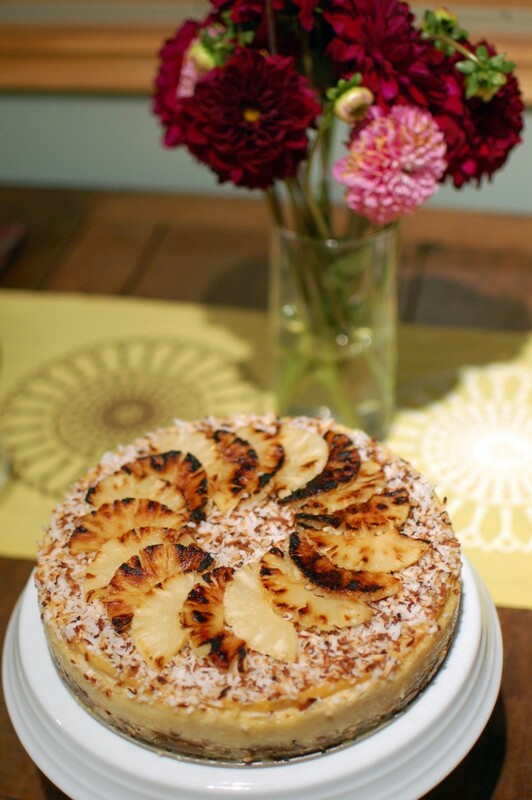 Though I’d never heard of a piña colada cheesecake before, it occurred to me that it would make for a great summer dessert. Something about the sweet, tropical wonderfulness of the cocktail seemed like it would go well with the creamy richness of a cheesecake. Plus I like experimenting and knew that Jennifer likes piña coladas. I couldn’t find a recipe quite to my liking, so I combined elements from a few into the combination that seemed best to me. I am happy to say it turned out rather delicious. 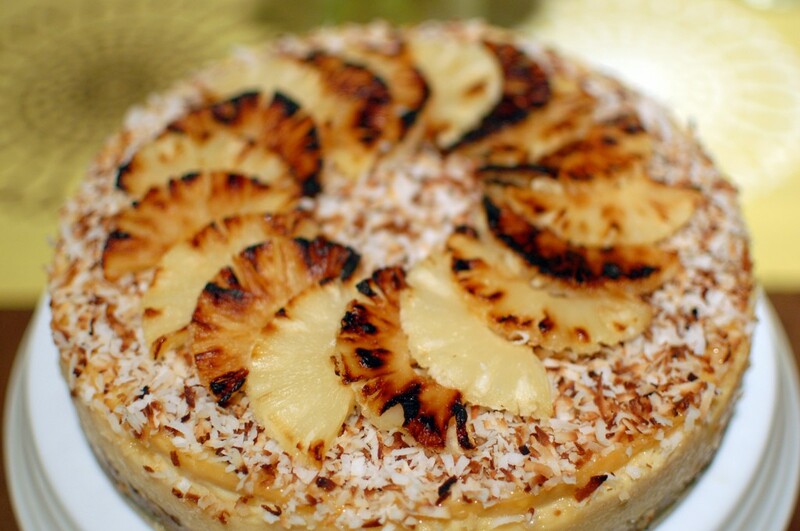 The subtle rum flavoring contrasts nicely with the sweetness of the pineapple, and the texture of the toasted coconut complements the creamy cheesecake. The cool creaminess of a cheesecake is perfectly suited to the combination of pineapple and coconut that makes piña coladas so delicious. If you’re looking for a delightful dessert to wow company on a hot summer night, look no farther! 1. Allow all filling ingredients to warm to room temperature. 2. Toast 1 cup coconut on a rimmed baking sheet in the oven at 350° for 5-10 minutes. Check frequently. 3. Grind up graham crackers until fine in a food processor (or crush them inside a ziplock with a rolling pin). 5. Thoroughly mix the toasted coconut, ground graham crackers and melted butter in a small bowl. 6. Grease the sides and bottom of a 9″ spring-form pan. 7. 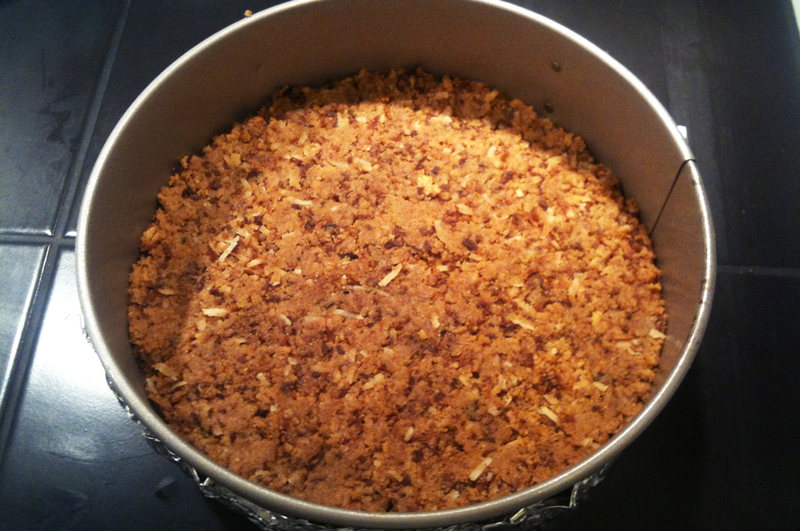 Press the coconut and cracker mixture into the bottom of the spring-form pan. 8. Bake the crust for 10 minutes on 350°. 1. Beat cream cheese and 3/4 cup of sugar in a large bowl just until smooth. 2. Pour off or strain the juice from the crushed pineapple into a small bowl. 3. Add the crushed pineapple, sweetened condensed milk, rum, coconut extract and vanilla to the cream cheese. 4. Beat until just evenly blended. 5. Beat in eggs one at a time with mixer on low until just evenly blended. 6. Pour mixture onto the crust in the spring-form pan. 7. Place a large pan (e.g., 9″ x 13″) of hot water on the lower rack of the oven. 8. On a rack in the middle of the oven, just above the pan of water, place the spring pan. 9. Bake for 45-65 minutes until the edges are set but the center is still jiggly. 10. 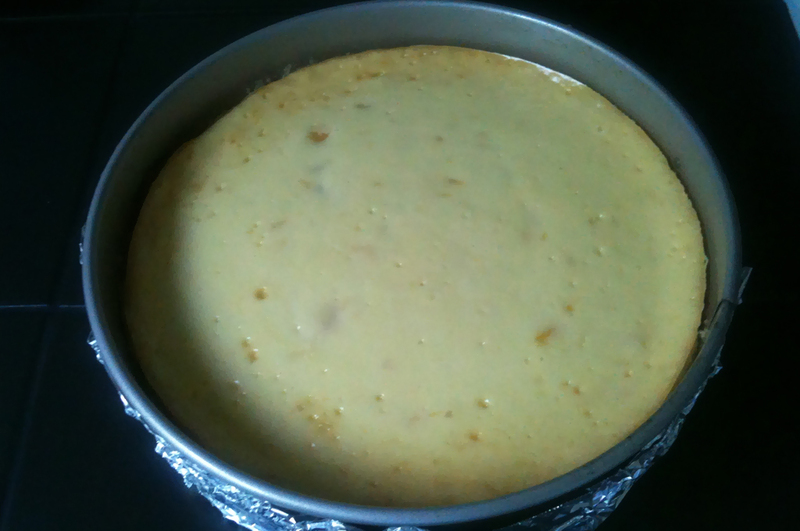 Turn off the oven, leaving the cheesecake inside with the oven door closed for at least one hour but preferably until room temperature (4-5 hours). 11. Once the cheesecake has reached room temperature, cover it tightly with plastic wrap and refrigerate it for at least eight hours. 1. Pour reserved pineapple juice from the crushed pineapple and the juice from the can of sliced pineapple into a sauce pan. 2. Place the saucepan of pineapple juice over medium heat. 3. 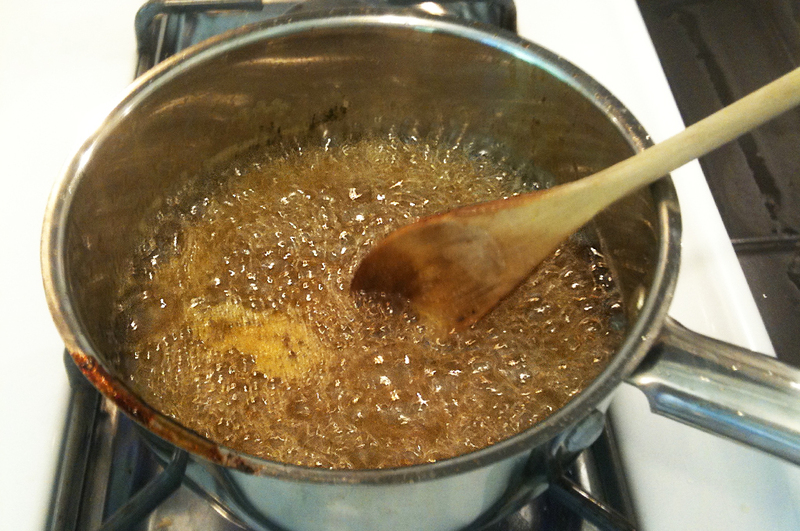 Dissolve 1 cup sugar into 1/3 cup water over medium heat in another heavy saucepan, stirring regularly. 4. Increase the heat to medium-high on the heavy saucepan and cover for 1 minute. 5. 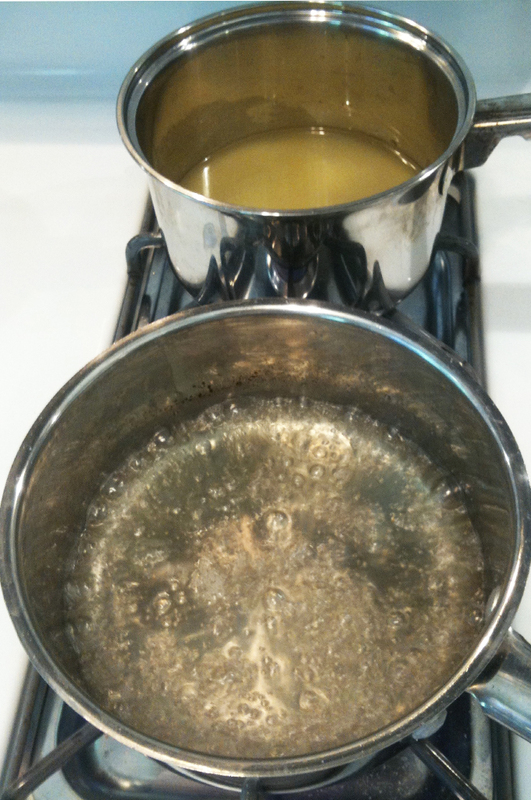 Remove lid and boil without stirring until the liquid turns a pale caramel color. 6. Stirring constantly and averting your face, slowly pour the pineapple juice into the boiling sugar solution. Caution: it will boil very vigorously! 7. Boil for five minutes. 8. Cover and refrigerate until thickened (at least 6 hours). 9. Toast 1 cup coconut on a rimmed baking sheet in the oven at 350° for 5-10 minutes. 10. Drizzle a thin layer of pineapple caramel sauce over the top of the cheesecake. 11. 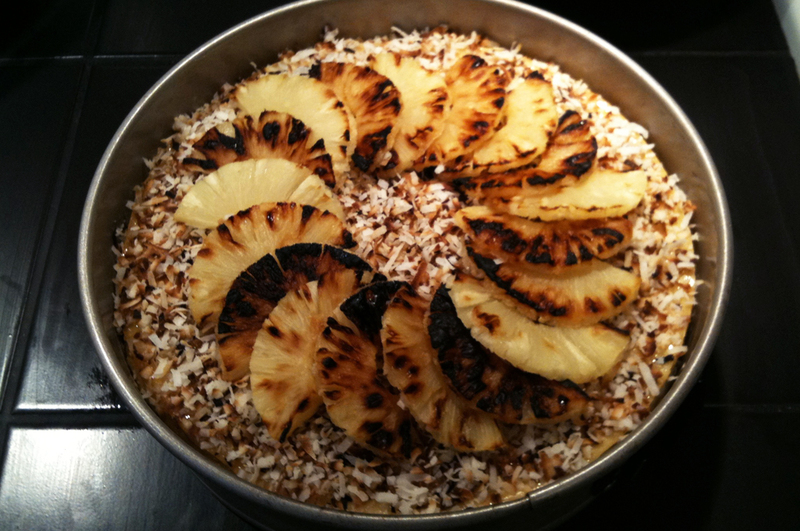 Sprinkle toasted coconut evenly over the top. 12. 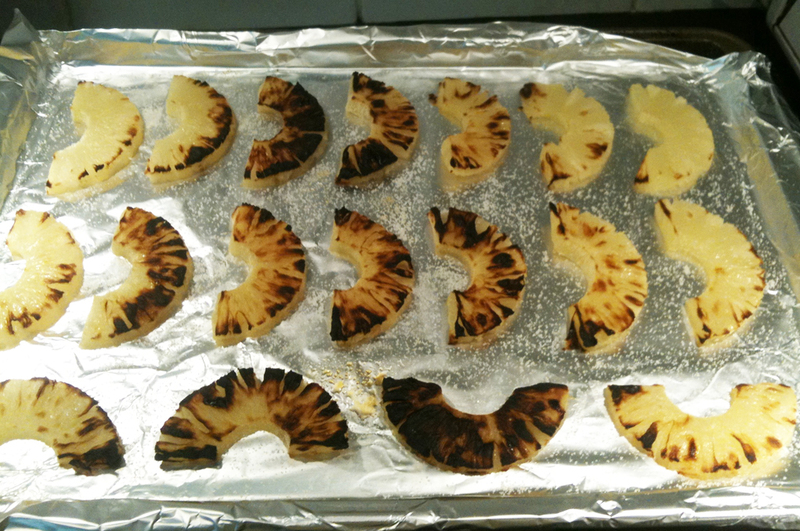 Cut pineapple slices in half and arrange on a baking sheet. 14. Broil in the oven until they begin to brown, about 5-10 minutes. 15. Allow the pineapple to cool to room temperature. 16. Arrange the pineapple slices atop the cheesecake. I motion for Greg to bring dessert to next couples night! One slice for me, please!